What started as a small construction project in the early 1950s developed into a 10-acre National Historic District designed and built by acclaimed Arizona artist Ettore “Ted” DeGrazia. When the town of Tucson grew near to his first studio on Campbell Avenue and Prince Road, DeGrazia and his wife Marion, a sculptor from Upstate New York, bought the isolated foothills property in the early 1950s to escape the encroachment. Following a regional tradition of building a chapel or shrine in thanks, DeGrazia’s goal was an adobe mission built from the ground up at the foot of the Santa Catalina Mountains. 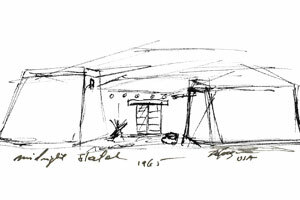 The artist made design sketches then gathered a crew of friends who made traditional adobe bricks with soil mixed with the water DeGrazia hauled up in his Model A. The adobe bricks were made onsite. With its rock floors, interior murals and open-air roof, the Mission in the Sun was built in honor of Padre Kino and dedicated to the Virgin of Guadalupe, whose image DeGrazia painted onto the adobe altar. Near the mission is the original home DeGrazia built on the property and the first small gallery where he displayed his art. As his fame and finances grew, DeGrazia designed a larger gallery on the property where he could exhibit his steady stream of new originals. He again assembled a crew to make the adobe bricks and help with construction. 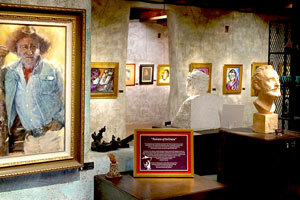 “DeGrazia had a vision,” recalled Marion. “He knew exactly what he was doing…When it was ready, we opened the door and the people kept flooding in.” The iron gates are a replica of the Yuma Territorial Prison gate, opened to the public in 1965, and the tradition continues as visitors from around the world flock to this legendary landmark of art and architecture. There are six permanent collections of paintings that trace historical events and native cultures of the Southwest. Rotating exhibitions display some of the 15,000 DeGrazia originals housed at the gallery, including oils, watercolors, sketches, serigraphs, lithographs, sculptures, ceramics and jewelry. A consignment room displays DeGrazia originals available for purchase, while the gift shop offers a wide selection of reproductions.